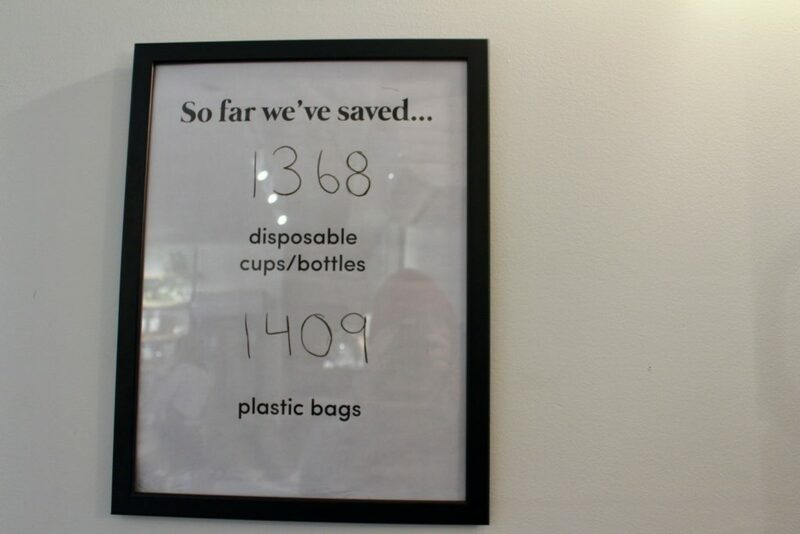 As of closing time on Oct. 24, The Tare Shop claims to have saved over 1368 disposable cups/bottles and 1409 plastic bags since its opening on Oct. 3. The Tare Shop is a package free café, a store and a community hub. The shop is the first of its kind in Halifax; the owner is hoping to make zero-waste living more accessible. “It’s been amazing and it definitely feels like business has been growing,” says Kate Pepler, founder of The Tare Shop. The idea of zero-waste is gaining popularity in a time of environmental crisis. A new report by the Intergovernmental Panel on Climate Change (IPCC) states it’s urgent to act on climate change within the next 12 years. Global warming must not increase more than 1.5 C or we run the risk of catastrophic irreversible damage, according to the report. Plastics are created from fossil fuels such as oil and natural gas, which releases toxic emissions when extracted from the earth according to the plastic pollution coalition. Only nine per cent of all plastic ever made has been recycled. In addition, 8.3 billion tonnes of plastic has been produced since 1950 according to an audit by Greenpeace Canada. Majority of the plastic waste in our landfills comes from consumers and corporations meeting a rising demand for single-use convenient packaging. The top 5-polluting corporations in Canada in order of greatest significance are: Nestle, Tim Hortons, Pepsico, The Coco Cola Company and McDonalds according to the Greenpeace report. When customers come into the shop, they weigh their containers, fill them with the products they want, and then pay. The Tare Shop’s daily waste tracker measures the cups, bottles and bags saved from people using the shop over other options. In the café, you can buy a coffee or tea and a rotation of local baked goods. When you purchase a beverage, it will be served in a reusable mug, or in a travel container if you can’t stay to drink. There’s a mug and container library (the majority of which has come from donations to grow the collection) if you’ve forgotten your travel mug or you impulsively decide you need all the chocolate covered coffee beans. The Tare Shop is hosting a series of events such as a How to: Zero-Waste workshop, Clothing and Halloween Costume swaps, and a speaker series. The first in the series is: The Forgotten Harmony, led by international bestseller Philip Sheppard. It will focus on how disconnected we’ve become with ourselves and its ripple effect on the environment. Students receive 10 per cent off on bulk and lifestyle products on Tuesdays, (easy to remember when student days at the Superstore also fall on a Tuesday). On Wednesdays, The Tare Shop offers 10 per cent off for seniors on bulk and lifestyle products. For those that may not have the time to fill their containers, there’s a ‘busy day’ drop-off option. “People can drop their containers off in the morning, before 11 a.m. with what they want in each container, and then pick it up after 3 p.m. and it will all be ready for them to go,” says Pepler. The bulk section has a range of products from oils, shampoos and conditioners, to nutritional yeast, tea, pasta and everywhere in-between (for a full list check thetareshop.com). It sells Cove Kombucha on tap available to drink at the shop and sold by weight. 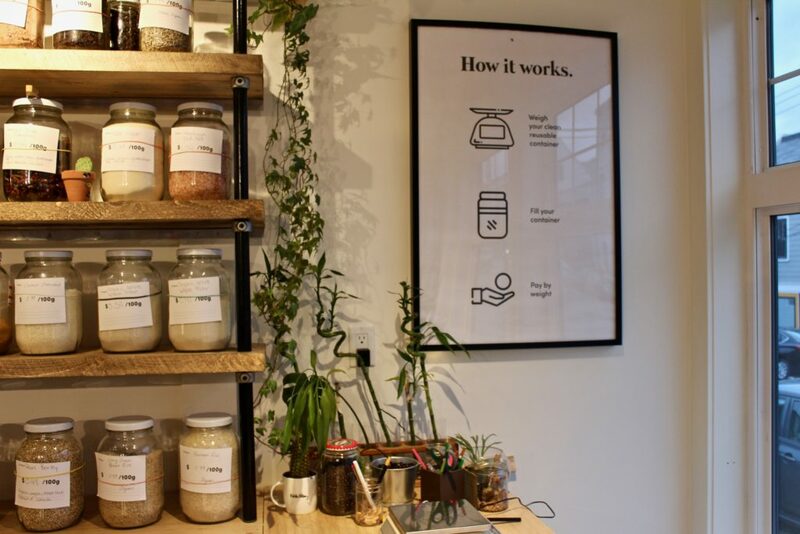 Frequent customer, Ashlyn Hughes, has learnt a lot about zero-waste living and how to eliminate packaging from her daily life since its opening. Pepler has been amazed by the support of the community and the growth from just three weeks of being opened.